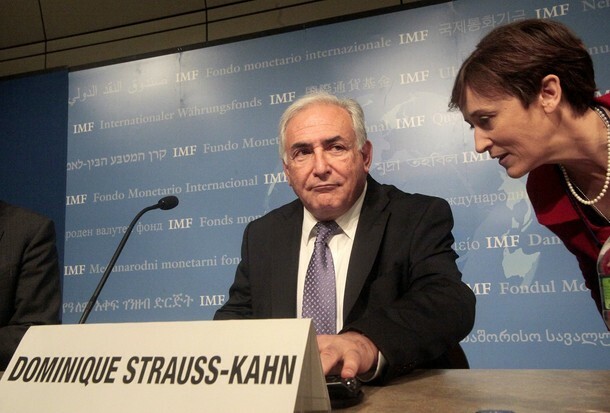 UNITED NATIONS, July 16 -- When the International Monetary Fund's Executive Board finally meets on Sri Lanka's application for a $1.9 billion loan, IMF spokeswoman Caroline Atkinson told the Press on Thursday, "all of the international community's views will be considered." The question posed, by Inner City Press, asked the IMF to respond to reports that "funds spent in the North are 'the jailer of these people and 'looks like internment.' What safeguards would be in place?" Ms. Atkinson's answer, referring to what she called the IMF's "good discussion with the authorities," did not mention any safeguards. Briefing at Minute 17:18. United Kingdom officials have made statements, which they have not retracted, that Sri Lanka's application for an IMF loan is "not moving," that the conditions are not right. While the US position has vacillated, the Obama administration's close attention to media probably means that the New York Times front page story of July 13, and the next day's editorial, makes less likely for now U.S. support for a $1.9 billion loan to Sri Lanka, whose military budget is $1.6 billion. Inner City Press also asked if the expulsion of Manuel Zelaya from Honduras has given rise to any changes or discussions within the IMF. Ms. Atkinson responded that "we have followed the normal international practice." She said that "we don't have any program with Honduras." 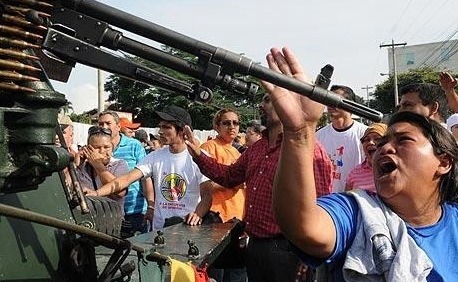 But the IMF last month opened up a Technical Assistance Center for Central America, Panama, and the Dominican Republic (CAPTAC-DR) in Guatemala City. IMF Deputy Managing Director Takatoshi Kato was quoted that "this center is an example of strong regional cooperation in Central America, Panama and the Dominican Republic... A region with almost 40 million people has significant economic potential. The Fund is proud to be a partner in the effort to promote regional economic growth and development, and hopes that CAPTAC-DR will serve as an engine to push forward the objective of a more economically cohesive region.” The latest regional technical assistance center will serve Costa Rica, the Dominican Republic, El Salvador, Guatemala, Honduras, Nicaragua, and Panama. So the IMF has a center which spend money to serve Honduras. Clearly, as in the case of Sri Lanka for the last four months, the IMF likes to dodge questions and, some say, accountability. But in light of the CAPTAC-DR, it cannot so easily dodge the question of Honduras. The World Bank has spoken to the question. When will the IMF? Footnote: Inner City Press also asked the IMF, "What is the IMF's response to the UN General Assembly's outcome document with its criticism of the IMF and geographical balance, etc? And please deny that you pick and choose and censor questions submitted online about pending IMF loan applications - like Sri Lanka." The former has yet to be answered; there has been one round of back and forth (without substantive answer) on the latter. We will continue to pursue this. On Sri Lanka, IMF Said Ready to Lend, Dodges Ethnic Cleansing, Where Are Obama, UK? UNITED NATIONS, May 20 – With the Red Cross blocked from access in Sri Lanka to the wounded and dying, with NGOs increasingly barred from the UN-financed camps for IDPs, in Washington the International Monetary Fund said Thursday that it looks forward to presenting for approval to its Board Sri Lanka's request for a $1.9 billion loan. The statement was made by the IMF's director of external relations Caroline Atkinson. Inner City Press online asked a follow-up during the Fund's biweekly press briefing, which Ms. Atkinson re-stated: please state whether as the Sri Lankan government says the proceeds of any IMF loan would support re-housing in the north, which some would described as ethnic cleansing? The U.S. subsequently confirmed this, receiving human rights credit for raising the issue. The UK has as well. After a contrary statement by the UK Ambassador to the UN, in response to Inner City Press' question at the UN Security Council stakeout, UK Foreign Minister David Miliband said he didn't think conditions for an IMF loan to Sri Lanka were right. Are they now? Now, after two weeks ago refusing to take the question at their briefing, the IMF says that while there is still no access to the killing zone in the North, while doctors who reported on the war as well as offering treatment are detained and interrogated, it wants to present the loan for approval by its Board within weeks. What happened, some ask, to the ostensible US and UK opposition? At the US State Department this week, the Obama Administration appeared to waver or move on from it previous position, both on the loan and as stated by the President following Time magazine's diagnosis that Barack Obama was failing the Sri Lanka test. The IMF's implicit argument that it is not supporting what a government does on the ground by lending to its Central Bank is specious. In fact, many experts on Sri Lanka note that the government's military offensive in the North was assisted not only by aid after the tsunami, but even more by the proceeds, to the Central Bank, of debt forgiveness. Now during the current crisis the IMF wants to make a loan to the Sri Lankan Central Bank. Ms. Atkinson alluded to, but did not give an explanation as requested by Inner City Press, of a “larger facility” being discussed. Victor's justice, victor's loans, some call it, as they call the UN's Ban Ki-moon's impending visit to Sri Lanka a sort of victory tour. Inner City Press leaves today on the UN trip. Watch this site.